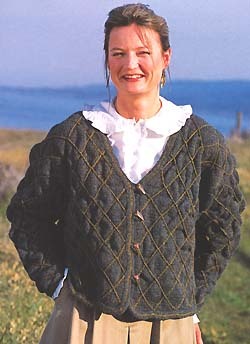 This jacket is knit using both Jamieson's Heather Aran and 2-ply Spindrift 100% wool yarn and is from Jamieson's Shetland Knitting Book 3. Yarn kits for 4 sizes for adults are detailed below. (see notes below for more information). The original colour Anthracite (1050) is no longer being produced by Jamieson's so Cedar (1060) has been substituted. If you would like to order the kit with an alternative colour, please specify this in the comment field of your order form. Four Buttons are required for the jacket and are not included in the kit prices shown above. These can be ordered from our extensive button collection. If you would like help in choosing a set to match, indicate this in the comment field of your order form.